BizjetMobile’s portable Chimp Iridium system comes with and without the satcom transceiver. For aircraft owners and operators looking to save money on airborne telecom costs, BizjetMobile offers a way to text and email over the Iridium and Inmarsat SwiftBroadband satcom networks for at little as $899 a month. The key to BizjetMobile’s pecuniary pricing plan is its portable devices, which require no supplemental type certificate for installation (although some require installation of an external antenna). The email feature–called GetMail–is a new development, and BizjetMobile is demonstrating this and all of its products at its NBAA exhibit (Booth 1462). 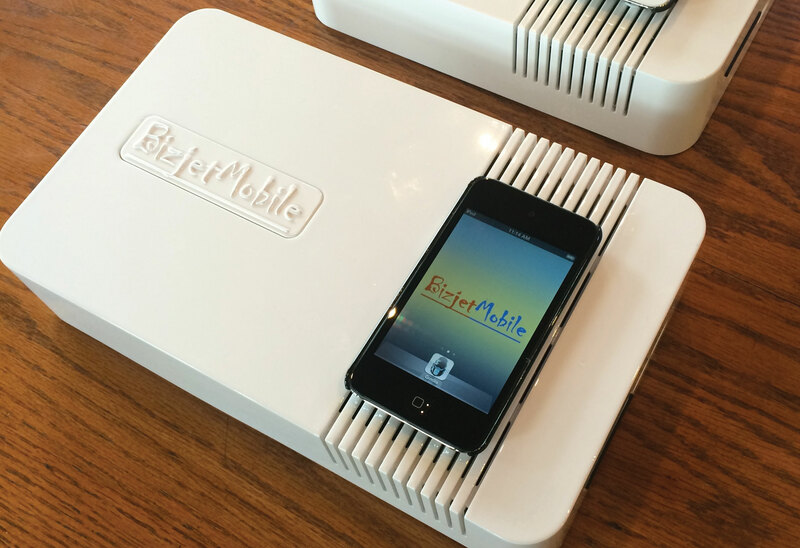 BizjetMobile offers two main types of portable satcom devices, the Chimp and Grrrilla. Chimp is an Iridium-based system, with devices that hook into either an existing Iridium transceiver in the aircraft or one with the Iridium transceiver included. Because of the Iridium network’s relatively low bandwidth, Chimp is designed for those who want to be able to send text messages (SMS) and email and make voice calls, but not access the Internet. Emails are done through BizjetMobile’s GetMail service and can’t include attachments. Iridium satcom is available worldwide. Grrrilla works on the Inmarsat SwiftBroadband (SBB) satellite network and like Chimp, taps into an existing SBB transceiver or includes its own transceiver. Because of the greater bandwidth offered by SBB, Grrrilla offers Internet access in addition to SMS, email and voice calling. While SBB works in most parts of the world, its coverage isn’t as widespread as Iridium. The cost-saving element for both Chimp and Grrrilla is the ability to have unlimited SMS and GetMail email for just $899 per month, worldwide. Chimp voice calling is $1.40 per minute. With Grrrilla, the user has the option of switching on Internet access, which is billed at $3.50 to $9.95 per megabyte. “The point is that communication these days is very different than it used to be,” said Bizjet Mobile CEO Dan Rich. “Everyone is constrained with bandwidth, that’s the reason why Twitter is so successful.” People can be satisfied with using SMS to communicate, which is an ideal application for bandwidth-limited and costly satcom. The GetMail feature is new and allows BizjetMobile users to use the system with their own email address instead of one that is dedicated to the satcom or aircraft. BizjetMobile sets up the user’s email address on the app (iOS only for Chimp and iOS or Android for Grrrilla). “Now your email inbox is on the app,” Rich said. When a user boards the BizjetMobile-equipped aircraft and opens the Chimp or Grrrilla app, the last 10 to 15 email headers are waiting. Clicking one of the headers opens that email (again, without attachments), but those that aren’t clicked aren’t fully uploaded, to cut down on bandwidth use. Every 15 minutes in flight, the inbox is refreshed with the latest 10 to 15 emails. Chimp systems are available without the Iridium transceiver ($25,000) for aircraft that already have Iridium installed, or with an Iridium transceiver and Bluetooth handset ($35,000). These systems require installation of an external antenna, which costs $5,000 to $9,000. In countries where installing such an antenna runs into regulatory roadblocks and significantly higher costs, BizjetMobile offers the $45,000 Version 3 portable system, which uses two antennas, each one suction-cupped to left and right cabin windows. This system includes a hardwired handset, and it automatically switches between antennas without dropping calls to provide seamless connections to the Iridium network. Grrrilla starts with a 200 kbps portable system for $76,000, plus low-gain antenna for another $18,000 to $20,000. A recent installation cost about $97,000, according to Rich. The medium-gain 332 kbps Grrrilla costs about $127,000, including installation of the antenna, Rich said. Bizjet Mobile’s new billing module was developed to help charter operators control access to expensive in-flight telecom systems and ensure that passengers are billed for their use of the system. “[Charter operators] are concerned that their clients are racking up thousands of dollars and they’re not getting [reimbursed],” he explained. The SMS and emailing covered by the $899 unlimited monthly charge isn’t the problem, but with a SBB Grrrilla installed, a charter client could turn on Internet access and rack up expensive megabytes. The billing module allows BizjetMobile to track the SBB usage for each flight and each user’s smartphone. This not only allows the charter operator to bill the passenger for their use of the system but also for BizjetMobile to send a message to the passenger, warning that they are about to buy some expensive satellite time.